My experience is that whilst most people in organisations are interested, only a tiny fraction will do something about it – and that a mixture of skills, aptitudes and attitude, and possibly adjustment to their job description and pay packet. Often a well placed champion can do this – an enthusiast, a leader, a motivator. The NET Model of Social Leadership in full, showing the three Dimensions and nine Components The NET Model of Social Leadership defines a style of leadership suitable for the Social Age. 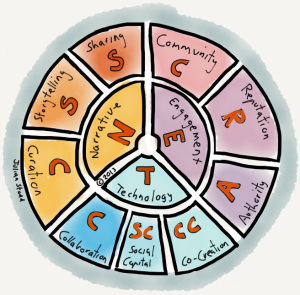 It consists of three Dimensions: Narrative (which covers ‘Curation’, ‘Storytelling’ and ‘Sharing’), Engagement (which looks at ‘Community’, ‘Reputation’ and ‘Authority’), and Technology (which explores ‘Co-Creation’, ‘Social Capital’ and ‘Collaboration’). I’ve already written three top level articles covering these areas: this is the sixth in a series exploring each of the nine components in a little more detail. Today: Authority in Social Leadership. By Jonathan Vernon in voice on March 6, 2014 .